I did some searching for some magazine carriers I could use in IDPA and some other competitions. Some searching and some helpful people I learned CZ75 pouches will work just fine. So while searching I found these on ebay. I received three for $75. 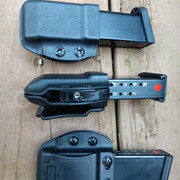 On ebay he shows them with two sets of holes so you could swith from OWB/IWB but I requested mine to be carried on left side OWB with rounds facing forward and no extra holes in black. They were glad to do that for me and I got them five days after I ordered them. They arrived and they look very nice, great workmanship. Unique in they have a MRD retention device . A smooth plastic insert inside the carrier .An extenal T15 Torx screw allows you to easily adjust the tension you wat to hold the magazine in the carrier. They are also made for other brands of handgun magazines and they also make holsters that look pretty nice but I have not seen one in person. 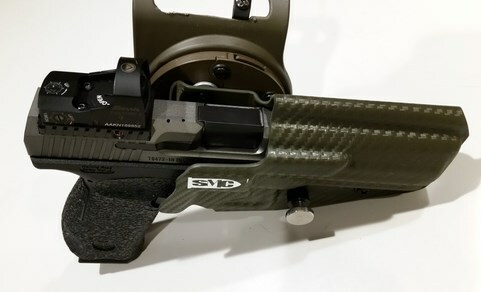 Re: Canik Kydex Magazine Carriers! Which model do you select for the Canik mags? I just got some mag carries from SMC, but they are better suited for USPSA using a 2 belt system. Select "GSM03", Code will come up as "GSM". Anyone find a nice iwb for the combat elite?? ?